I love, love, love when customers purchase from the Crystal Allure Awareness Jewelry Collection because their purchase has meaning. And when they share, I am humbled by some of their stories. It is exactly for these reasons that I dedicate my talent to designing transplant awareness jewelry. I received the earrings today. I am very pleased and my sister will be too when she opens the gift up. Her husband passed away 18 months ago. He had 3 kidney transplants, so they will have a meaning for her. Thank you for sharing your talent and also for a smooth transaction. It's been awhile since my last jewelry wardrobe board and this time it was quite easy to choose a piece to build around. You can't help but love our Green Grossular Garnet Gemstone Heart Leaf Pendant Beaded Necklace (N085). It features lush green garnet gemstones paired with natural wood (depicting our wonderful green forests') and the Karen Hill Tribe heart leaf pendant adds just the right amount of femininity to this sterling silver accented beaded necklace. Some of the pieces used to build this lovely wardrobe include: Blouse and Trousers by Charlotte Russe; Miu Miu Coffer Bag; Bath and Body Green Herbs Cylinder Candle and Borghese Protettivo Nail Laquer in Orion. The latest arrivals to the Swarovski crystal Lovlots collection are the Feline Favorites Crystal Cats. Adorably sweet and oh so sparkly! Meet all these wonderfully cute creatures in Swarovski Crystals' charming animated short showcasing each cats' multifaceted purr-sonality. I adore pets and have several cats of my own. Each of these beautifully designed crystal cats can very easily depict some of my cats purr-sonalities. I simply must have them ALL!! I was introduced to a new search engine, by a fellow blogger, which is specifically designed for artisans. And I wasted no time in getting Crystal Allure listed! Trent Colwell operates a new start-up, Findings-finder.com, and like most search engines it's -FREE (we all like free right?!). What makes Findings-Finder different is that it is "human-powered". Everything that is indexed has been manually checked (strange concept in today's world -right?). By personally visiting and verifying sites submitted, Trent's search engine produces link results that are "on-topic, current and useful". Take a moment and check it out! In other (free) news: Don't forget -today starts the Favors With Love week long giveaway. Hop on over there to get your name in for some fabulous FREE gifts and a chance to win the beautiful, one of a kind, Crystal Liquid Silver Y Beaded Necklace! Use the image link in the right hand column. Let's get this out of the way before proceeding -WOW!!!! 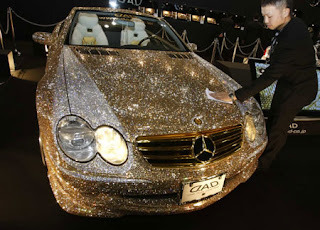 Can you say bling, bling? In a search of the internet, I came across this picture and caption and just couldn't resist sharing it with my readers. Forget driving it -you'd blind everyone! But it sure is purdy!! I have been consumed. Yes, with my website. But, I needed to dedicate this time to the redesign. It just has to be done so I can move on to more important things. So, I've been plugging away at the website and I'm quite pleased with how it's turning out. I'm excited to enter the fall season (my favorite time of the year!) with the new look in place and new designs to follow. Yes, yes. It's still summer. But you know how that goes...in business you must always look ahead. With the new website look, there have been MANY changes (too many to count or even list) and I still have much left to do and finish. But, I'm excited about our new Learning Resource Center: Jewelry Articles. I've had this feature in place (in various forms) since I started in business, but with the new web look, this whole bigger concept just fell into place -and it feels quite at home. Again, still working on the page a little, but you can get the idea. The purpose of the Learning and Resource Center is to provide information on beaded jewelry, caring for your Crystal Allure handmade and beaded jewelry, proper measuring and even general information on some of the techniques I've used and the materials of our designs. It is my hope this added information will be of benefit to my customers, visitors and fellow artisans. My task will be to begin filling the page with useful information and jewelry articles (I have tons of info for the page, just need the time to format it into something readable and get it listed). But, you can hop on over to the website now and read what information is already available and feel free to comment below on what information you'd like to see. Psst. I haven't forgotten about you Favors of Love! I know I need to get that picture to you and I planned on doing that in the next day or two. Tree agate, as a healing stone, is said to bring inner peace, calm the nerves and boost the immune system. That makes this stunning awareness gemstone bracelet the perfect piece for both those pre- and post-transplant! I just love the tree agate gemstones in this design -they are so natural and organic. 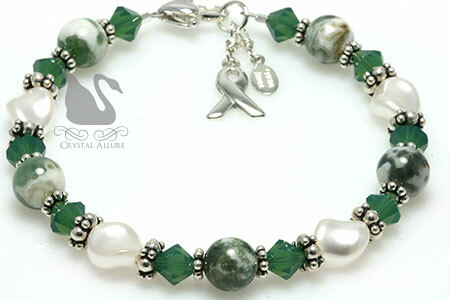 The overall design features the tree agate gemstones, lovely palace green opal Crystals by Swarovski, white twist Swarovski Pearls, sterling silver Bali and awareness ribbon charm. Pick up the matching beaded gemstone earrings for a complete transplant jewelry set! 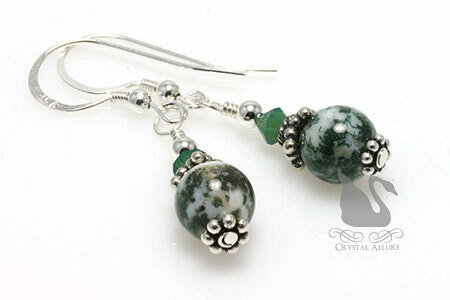 This unique pair of handmade beaded awareness earrings feature tree agate gemstone accented with beautiful palace green opal Swarovski Crystals, .925 Bali bead star cap and Bali spacers, sterling silver beads and earwires. The length is 1" from the bottom of the earwire. Tree Agate is a naturally formed gemstone. For this reason, please be aware of the slight variances in the stones, which lend to their uniqueness, and that you may not receive the exact stone pictured. Whether you have purchased from Crystal Allure before or not, you can earn FREE jewelry! If you would like to see Crystal Allure Beaded Jewelry in one of your favorite stores or boutiques, simply contact us with the store name, address, phone #, and contact person's name. If they place a wholesale order with us, you will be given a special 30% off coupon code.